The local council utilised their popular football club to promote sustainable travel and community ties through a series of events including; A led cycle ride; a Mascot competition and a kick-off event, which encouraged visitors to walk cycle and use public transport. 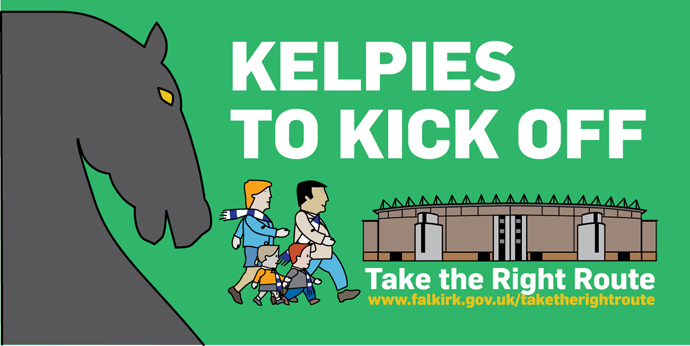 The Kelpies kick-off event in 2016, led 254 participants around the Helix park so they could take in the “Iconic Kelpies”, underlining the difference between walking and motorised transport, finally arriving at the football club. The event was incentivised with a goody bag, stunt shows, free match day tickets and a snack voucher. The project was supported by pitch side advertising, which reached up to 8750 people on match days and underlined messages of staying fit, saving money, reducing stress and taking the right route. Social media such as Facebook and twitter spread the information farther afield and this is event is now planned to take part every year.